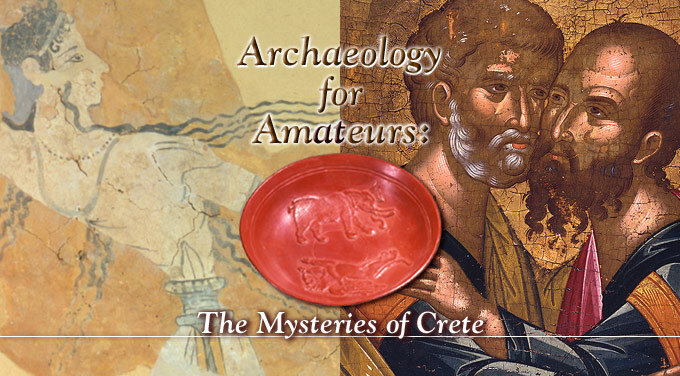 Archaeology for Amateurs: The Mysteries of Crete is an introduction for novices to the methods and approaches of archaeology. It focuses on the island of Crete – in particular, a region of Crete called Sphakia – and it handles excavation, field survey and art history. The course covers three main epochs: Prehistoric, Graeco-Roman and Medieval-Modern ranging in date from ca. 3000 BC to AD 1900. After the publication of the website, Lucia Nixon and Simon Price were approached to author an online course on the subject for the Alliance for Lifelong Learning, in association with Technology-Assisted Lifelong Learning (www.tall.ox.ac.uk). The Alliance (www.allLearn.org) is a partnership between Oxford, Yale and Stanford universities, and is aimed at their alumni, who pay to take a range of courses at a set time, with the guidance of an online tutor. We hope that the course will be useful for a variety of papers in Archaeology, Classics and History which require an introduction to archaeological methods, or make use of case studies on the relationship between archaeology and history. It will also be of interest to those with a passing interest in Crete who wish to learn more.